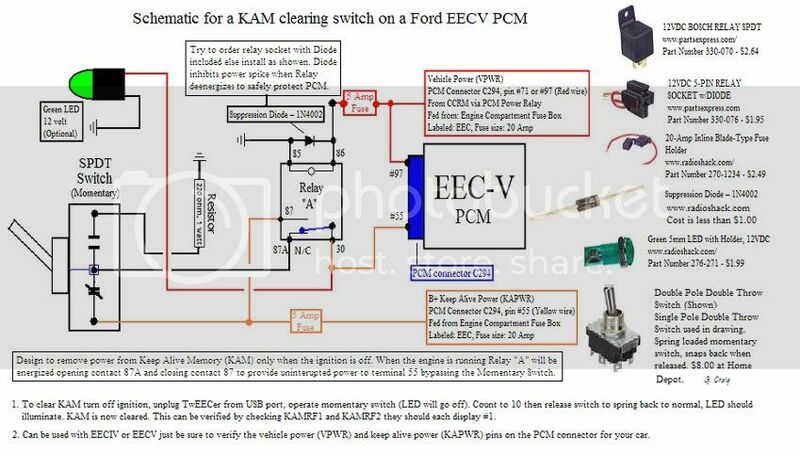 Attached are images of a KAM clearing switch schematic and the switch and KAM power LED installed under the cup holder in my 98 Cobra. 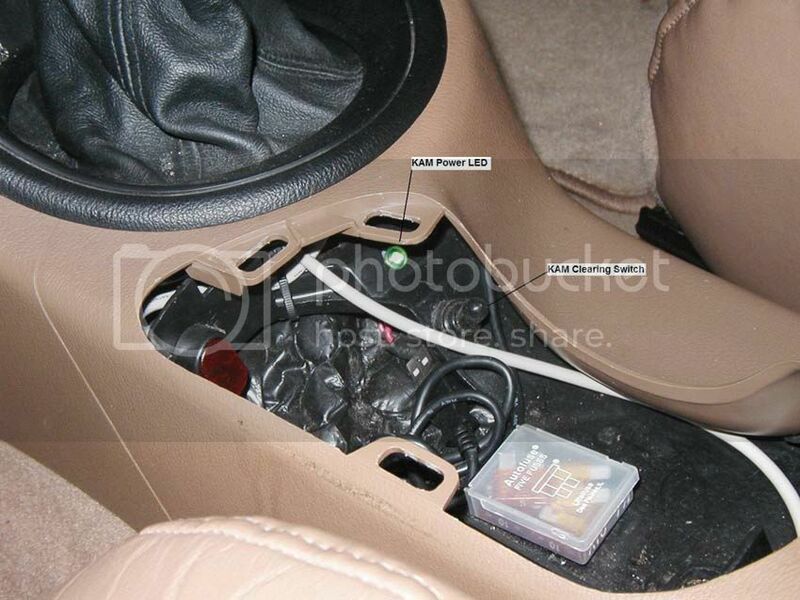 I prefer to install them out of sight and the console under the cup holder makes for a great location for easy access. The relay and fuses are installed behind the right kick panel (Passenger side). All connections are soldered (wire nuts or crimp on connectors are not recommended) and covered with 2 pieces of heat shrink tubing to insure they are well insulated. Finally the wires are wrappeded in split loom from the kick panel to the cup holder area. Good luck with your install. If you have any questions drop me a PM. Last edited by PoweredbyEECV on Tue May 25, 2010 2:17 pm, edited 3 times in total. TWEECER-RT with BE & EA Software, DataQ 148U for AFR & 3 bar MAP sensor, Wide Band Commander, KAM clearing switch. Stock Engine w/: V1, S-Trim w/AC @ 10 PSI, 60 lbs injectors, T-Rex FP, FP set at 45 psi, no FMU. Custom CAI, IAT relocated, ProM-77 MAF. Scream'in Demon coil packs and Live Wires. Yes it does remain on all the time except when KAM power is disabled but because it is an LED it draws very little current. The car has sat for a month and started right up. The LED is optional but I like the fact it gives me a status that everything is working correctly. if you reset kam's that often why not just disable them in the tune? decipha wrote: if you reset kam's that often why not just disable them in the tune? Some strategies may not have the KAM-clearing feature implemented. Or someone is using some other editor other than BE and doesn't get the ability to create a KAM-clearing tune. However even if you are using another editor, you should always be able to disable adaptive learning so the KAMs don't learn. That seems far more useful than clearing them all the time, particularly since personally, I find adaptive learning gets in the way during the tuning phase. But the submission is interesting. If someone is so inclined to install a hardware KAM-killer, this would work and would've probably been quite useful 3-4+ years ago. But even when I was still using TunerPro and CalEdit, I just loaded one of my tune positions with a CBAZA tune and flipped to it to "kill" my KAMs. GUFx and CBAZA EECs have the same processor, but different RAM chips so CBAZA on a GUFx EEC crashes. Part of any code crash is the EEC clears the KAMs, so that trick worked like a charm and is still a valid way to do it today. I've actually had this installed for several years and found it is reliable. My car is my hobby and I enjoy modifying it so this was another "project" that provided therapy if you know what I mean. Just trying to contribute to the effort. It looks like part of the image was cut off... not sure why??? Last edited by PoweredbyEECV on Tue May 25, 2010 12:57 pm, edited 1 time in total. looks fine to me, might not have loaded fully for you for some reason. dualdj1 wrote: looks fine to me, might not have loaded fully for you for some reason. Yep, that was the problem it looks great now.